Pikes Peak Automated Pressure Control Upgrade Kit - FREE Shipping! Step into the future a little early. The Automated Pressure Control upgrade kit is the next major evolution in commercial rosin pressing.This feature replaces your Dual Pressure regulator system with a fully digital pressure control unit, thereby dramatically increasing material throughput and ease of use, even with the most difficult to press materials. This upgrade kit is available for all PurePressure rosin presses as a one time, plug-and-play upgrade, which runs on our Pressware™ system. 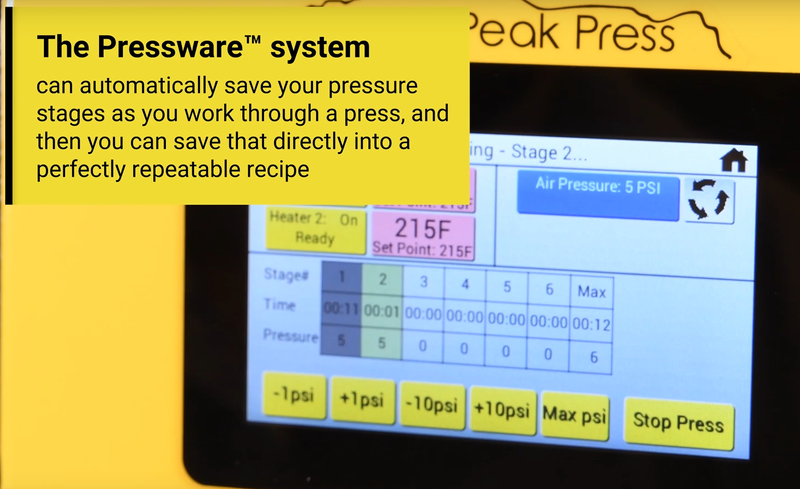 With the Automated Pressure Control upgrade kit, a PurePressure press will literally help train you how to use it with its preset recipes. Tested on 6* bubble hash, the system offers a slew of new features for experts to take advantage of as well, including the new warmup pre-press option. If you're upgrading your PurePressure rosin press, shipping and handling both ways is included in the Upgrade Existing Press option. Read below for more details. 1) Adding to a new press order? No problem! We'll install it during the build process so just select it when you're adding your rosin press to your cart. 2) Upgrading an existing press? Here are the simple steps to get your PurePressure rosin press upgraded as quickly as possible. Step 1: We send you an empty box with padding and a return label. Step 2: Uninstall your pneumatic and electronics panel and mail everything back to us. We will have a video guide here ASAP! Step 3: 1-2 business days after we receive your package, we will send you the upgraded electronics panel and pneumatics panel back to you. Step 4: Reinstall both panels and you're done!